In France, it was called Art Nouveau and Style Moderne, and once this modern manner dominated the 1900 World Exhibition in Paris, it came to be known as Style 1900; it was also referred to as Style Métro (after Paris metro designer Hector Guimard) as well as Style Mucha (after the great Czech graphic artist whose posters are considered Art Nouveau par excellence). In Munich and Berlin it was called Jugendstil, and in Austria-Hungary it was known as the Sezession. The Belgians proudly called it Mouvement or Ligne Belge (Belgian Line). Art Nouveau was a truly universal turn-of-the-century phenomenon and it was eagerly, even ecstatically adopted in Prague. In fact, Art Nouveau architecture influenced the city-scape of Prague as significantly as did the Gothic and the Baroque before it. 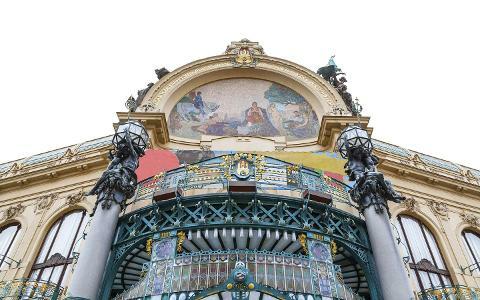 At the end of the 19th and the beginning of the 20th centuries Prague was experiencing a whirlwind of national revival activity and ultimately this movement was embodied in the form of Art Nouveau. 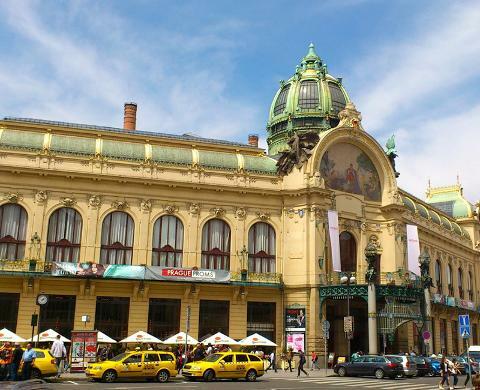 From the Main Train Station to the monumental Municipal House, to the entire district of Josefov (the former Jewish Ghetto), Art Nouveau constructions represent some of the most significant sights of this city. Most of us—when we think of the Art Nouveau buildings and fine art of the early 20th century—automatically picture intricate floral forms in ironwork and those dreamy, mythic Art Nouveau women with flowing hair. On Insight walks in Prague, we emphasize that these commonly recognized features of Art Nouveau aesthetics cannot be fully understood without taking into account the new culture of cosmopolitan entertainment, enthusiastic consumption, new opportunities for travel and leisure, and an array of modern technological conveniences that arose at the turn-of-century. 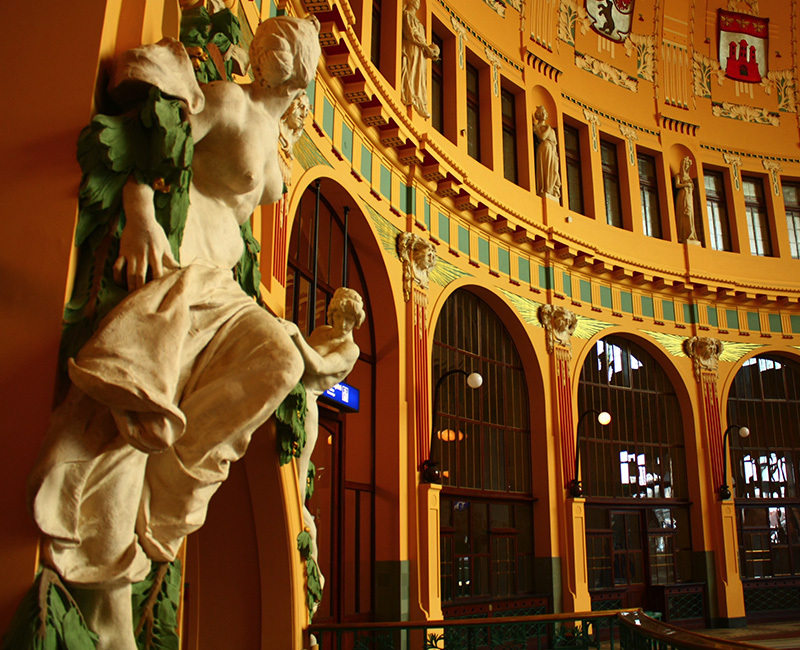 While every major Czech artist of the period contributed to the flamboyant Art Nouveau designs of Prague’s Municipal House; equally important, the building was also one of the first in the city to be equipped with central heating and ventilation, a drinking and utility water-supply system, electrical as well as hydraulic elevators, a steam-powered laundry and an intercom network. 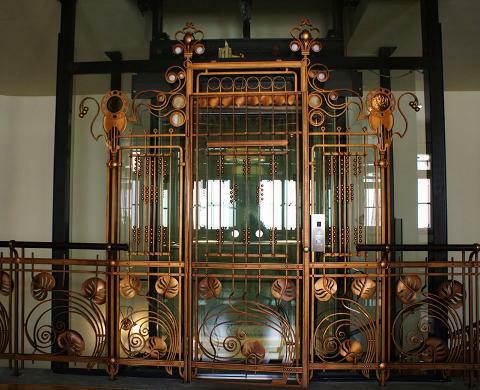 Put simply, Art Nouveau isn’t only a radical new design aesthetic. 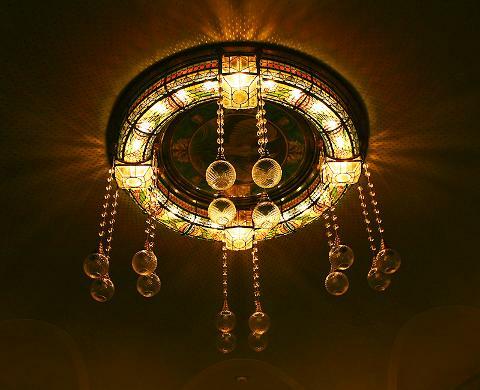 It represents a pre-war social elite with new standards for modern comforts and luxury, a clubby upper-class who drank absinthe and the first mixed-cocktails, booked voyages on ocean liners, sent telegrams, and read fashion magazines. 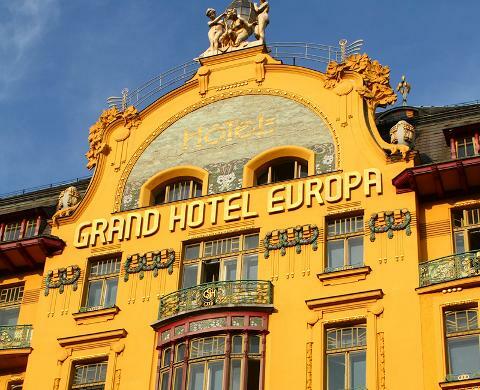 It isn’t an accident that most Art Nouveau buildings are hotels, elegant bars and restaurants, and train stations. These were the watering holes of the first globe-trotters, those enjoying the fruits of nineteenth-century industrialization in the short-lived first decade of the 20th century just before global war swallowed up their world. During this walk, you’ll learn to recognize the features of Art Nouveau, from the gingko bilabo leaves on facades which reveal the style’s oriental influences to the elaborate light fixtures that mark Art Nouveau interiors to the curvy, campy typography on building signs that echo contemporary magazine and poster graphics. 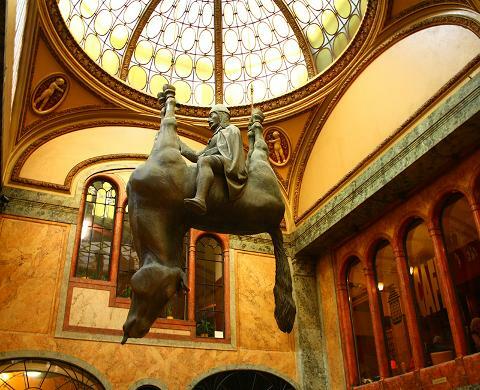 You’ll visit the beautiful Lucerna bar (once owned by Vaclav Havel’s family) and the elegant Grand Hotel Europa—examples of a moment of Czech optimism at the turn-of-century, signaling the region’s transcendence of older ethnic grievances and its readiness to join Europe by participating in European-wide avant-gardes. s an important parallel, throughout the walk, we visit examples of Prague’s Cubist and Rondocubist architecture, including The House of the Black Madonna (created by Josef Gočár in 1910 as an urbane department store) and the Legion’s Bank. In many respects, Prague’s Cubist architecture (a building style unknown outside of the Czech Republic) surpassed even Art Nouveau as a statement of the city’s newfound sense of modern sophistication and resurgent national identity.